It’s the height and the beard that first strike you the minute you’re expertly greeted by the French-born Philippe Leboeuf. At 6-foot-4, he gets his height from his mother – a 5-foot-9 Swede – but the beard is all his own. 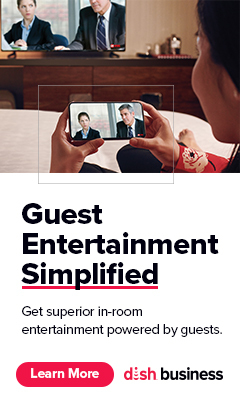 It is certainly uncommon to see on a hotelier, especially for someone of his status: general manager of the 5-star Mandarin Oriental Paris and the brand’s area vice president of operations. Mandarin Oriental Paris GM Philippe Leboeuf on the property's rooftop. 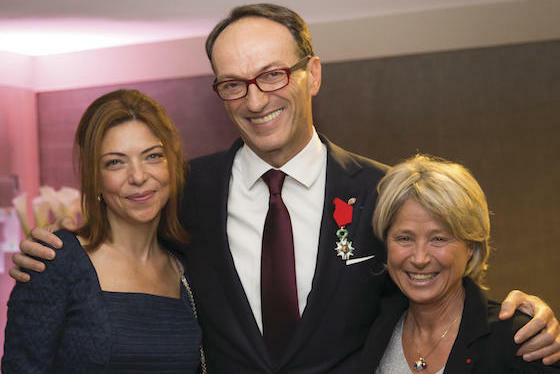 “I guess I’m close to my feminine side, especially in our business,” says the 59-year-old Leboeuf, whom HOTELS readers chose as winner of the 2018 Independent Hotelier of the World. He says this as he sips the same type of mineral water once consumed at the courts of Louis XIV and Louis XV at Versailles, while simultaneously eating just-arrived bites from the hotel’s kitchen, staffed by Michelin-starred Chef Thierry Marx, who’s been with Leboeuf since the property opened in 2011. At the time Leboeuf accepted the GM position with the as-yet-unopened hotel, one of only a handful in Paris to be granted palace status, he was general manager at London’s iconic Claridge’s. And at eight years now, it’s also the longest he’s worked at one place. He became area vice president of operations in 2013 after years of specializing in hotel openings, mostly for Concorde Hotels & Resorts and Rosewood Hotels & Resorts. In addition to Mandarin Paris, he supervised the opening of Mandarin Oriental, Marrakech in Morocco in 2015 and more recently has had operational oversight of Mandarin Oriental, Geneva. His daily routine consists of early rising, a drink of plain hot water and ideally a swim, but almost religiously a bike ride to work. 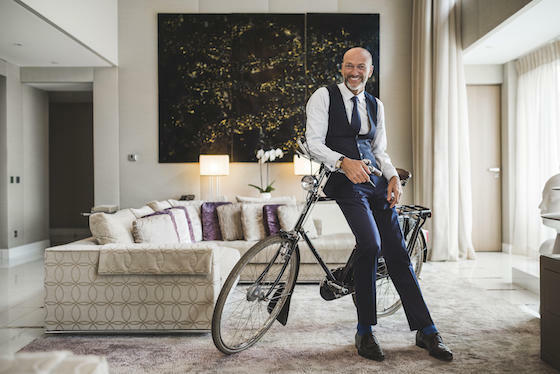 Leboeuf has been a competitive cyclist for 20 years; in his days as managing director of the Hôtel de Crillon he used to fly the Texas flag for the Texas-born Lance Armstrong, often having a beer with the famous cyclist after each Tour de France finish. He makes sure to get to work early, before meeting with his staff at 9:15 a.m. to go over what worked and what didn’t — “moments of delight and moments of opportunity,” as he refers to them. What if the moments that didn’t work dominate? His personal assistant, Sophie Verneuil, says Leboeuf knows how to strike the right balance. “I say walk the talk, don’t talk the walk. I’m more about doing than speaking,” Leboeuf says. In his office at the Mandarin Paris, there sit three hats from the three “C’s” – the Crillon, The Carlyle and Claridge’s. There are piles of books that emphasize growth as an individual and a poster of the 2008 Owen Wilson film “Marley & Me” with Leboeuf’s face superimposed over Wilson’s and his 9-year-old border terrier, Archie, subbing in for the golden retriever. Leboeuf and Archie take a moment together on the hotel's terrace. There’s also a small meditating gold frog on his desk. The frog isn’t just for show. Meditation, and in turn, time management, is important for Leboeuf and he tries to prioritize it every day, even if for just a small moment. “Sometimes he does take five minutes, and we don’t disturb him. No phone calls, nothing. And it’s important just to refocus,” Verneuil says. Like many well-trained GMs, he walks through the rooms daily, especially the VIP ones. He checks the towels, turns on the TV and takes a look under the bed. 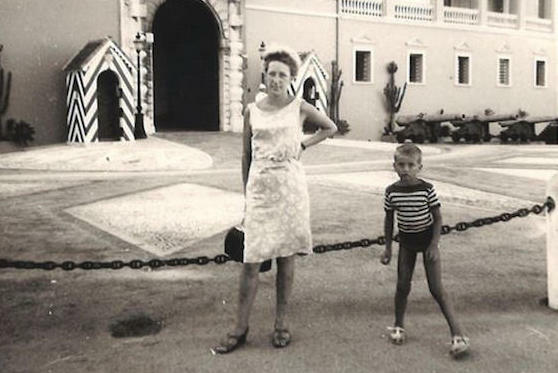 Leboeuf as a child with his mother, Maud. Though Leboeuf has managed some of the world’s most prestigious hotels, he also has worked as head of housekeeping and understands the importance of seeing the property from all angles. Born in Alsace, Leboeuf grew up in the countryside, “the boondocks,” as he puts it, with his mother, a brother and a professional soccer player – his father, who went on to open a diner-style restaurant later in life. Like his father, Leboeuf had his sights set on sports, at the time volleyball. His mother, Maud, had other thoughts. His first job in the industry was as a reservation agent, then not long after, as an attendant on the private jet of then-President Francois Mitterrand. Ultimately, he graduated from Cornell University and HEC Management School in Paris, becoming fluent in English and proficient in Italian and Spanish. In 2014, he was awarded France’s Knight of the Legion of Honor – the country’s highest decoration. Leboeuf at a ceremony awarding him France's Legion of Honor in 2014. A Chacun Son Everest's Christine Janin decorated him with his insignia: She is pictured (right) with Leboeuf and his partner, Pepita Diamond. Since his entry into the industry, he has traveled constantly and worked all over the world. During a period when he was out of work and visiting his daughters in New York, he met with hotelier James McBride for coffee – a moment which led him soon thereafter to an almost year-long stint in Dallas, Texas, as vice president of operations at Rosewood Hotels & Resorts. Leboeuf is also president of A Chacun Son Everest, a foundation for children with cancer and more recently, women diagnosed with breast cancer. 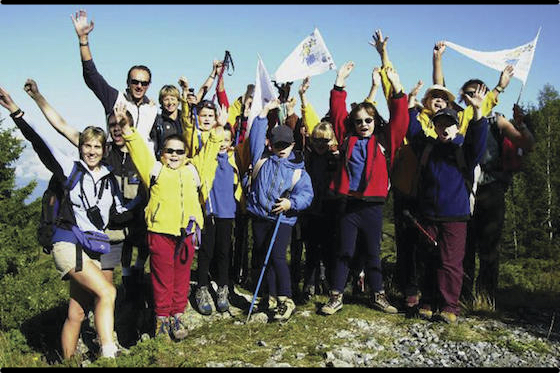 The organization, which Leboeuf joined in 1997, was started by Christine Janin, the first French woman to summit the peak of Mount Everest and with whom Leboeuf became friends through his time at the Crillon. In addition to Archie and his partner, Pepita Diamond, he has two daughters from a previous marriage, both of whom live in the United States. One works in the film industry, and the other, who received a Ph.D. from Harvard University, revolves her research around feminist philosophy. Joanne Budge, senior director of people and culture at Four Seasons Hotel New York, worked with Leboeuf in the 1990s at the Westbury Hotel on New York’s Upper East Side (since converted into luxury condominiums). Leboeuf (back, far left) with children from the charity he's worked with since 1997: A Chacun Son Everest. The mother who drove him into his life’s work died in 1995 from cancer. He had just received his first GM post at the Crillon at the time of her death and told her the news while placing a rose on top of her coffin. He says he entered the Hotelier of the World contest for her, as a tribute. For all the famous hoteliers who have influenced him – ex-Carlyle GM Frank Bowling, Ritz Paris President Frank Klein – when asked who inspires him every day, it’s A Chacun Son Everest’s Janin and his partner, Pepita. “They are positive people, they make me happy, make me laugh,” he says. Leboeuf does not so much have regrets as he does lingering thoughts about how the past could have been prioritized differently. “I wish I would have spent more time with my children, which I didn’t as much going into the industry,” he says. “Retirement, I don’t know. I’m a bit Buddhist about it. Like the frog,” he says, gesturing to the meditating statue on his desk. It’s at the mention of having more time that his eyes finally light up. “If I could meditate, instead of five or 10 minutes, maybe 20 minutes a day? That would be ‘wow,’” Leboeuf says. As to where this industry is headed, his thoughts may mirror his own personal preference when staying in hotels. Despite a history of working within luxury, when he travels, he stays in offbeat, experience-driven properties. “Because I don’t want to wear suits. I don’t want to be the ‘suit’ with a capital ‘S’ or be confined to one image,” Leboeuf says.